OAKLAND — As 2008 ends, more questions than answers remain about the brazen slaying of journalist Chauncey Bailey 17 months ago, and they raise increasing concerns about this city’s beleaguered police force — questions that some officers say are now being asked within their own ranks. Officers and recently retired officers interviewed for this story describe the department as fractured, lacking confidence in Chief Wayne Tucker and his executive command staff, and neutered in its crime fighting abilities. Continuing violent crime, chronic understaffing and even the inability to keep and make public accurate crime statistics besiege the department. The Bailey slaying — Oakland’s most high-profile killing since the Symbionese Liberation Army assassinated schools Superintendent Marcus Foster in 1972 and the most prominent slaying of a journalist in the U.S. in 31 years — heightened these issues, officers said. An officer of senior rank, who spoke on condition he not be named because he fears retaliation for speaking critically of the department, said he has never seen it so defeated. “People are embarrassed to say they are Oakland cops,” he said during an interview. 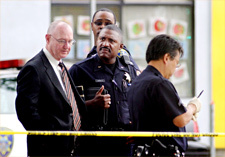 Michael Rains, a lawyer with deep knowledge of the department and who represents a detective and a lieutenant being investigated for the handling of the Bailey case, said officers are fed up, in part because Tucker and others misled the public about the timing of a raid on Your Black Muslim Bakery — the organization some members of which are believed to be responsible for the editor’s death. If the raid had gone off as first scheduled on Aug. 1, 2007, Bailey’s Aug. 2 killing might never have happened. But the raid was postponed 48 hours to accommodate the vacation schedules of two senior SWAT commanders who were on a backpacking trip, according to numerous department sources. Tucker and other commanders denied there was a delay for more than a year, then backtracked this month when questioned by The Chauncey Bailey Project and admitted the postponement. Officers, Rains said, see their chief as having committed “pure and simple hypocrisy” because they are held to a strict standard of honesty that commanders don’t apply to themselves. “If you have a police department that’s not being honest with the public and with their own employees, but expecting the employees to operate at a different standard than those who run the organization, then the people who run the organization need to go,” Rains said. Tucker and Assistant Chief Howard Jordan declined to be interviewed for this story. So did Mayor Ron Dellums, who has asked the state Justice Department to conduct a parallel investigation to an ongoing internal affairs probe of how the Bailey case was handled. Dellums also appointed a retired Superior Court judge to oversee the matter as a special master. Justice Department officials — including Attorney General and former Oakland Mayor Jerry Brown — have refused to discuss the investigation. Another officer said that in addition to the raid delay, police are asking whether the Bailey case is symptomatic of deep problems. “On a confidence level, how many other cases “… fall right in line with the Bailey case that (were) not properly done?” said another officer recently moved to patrol from a specialized unit. He asked not to be identified because he is not authorized to speak publicly. Why was so much critical evidence that seems to point to a conspiracy to kill Bailey — a video of Your Black Muslim Bakery leader Yusuf Bey IV mocking the killing, an interview of a bakery worker who said Bey IV bragged that the slaying was a testament to his power — not included in lead detective Sgt. Derwin Longmire’s case notes as required by department policy? Why did Longmire’s case notes not include information from a tracking device that showed Bey IV was outside Bailey’s apartment seven hours before the killing? Can authorities win a conviction with the only person charged in the killing, bakery handyman Devaughndre Broussard, claiming he falsely confessed out of misguided loyalty to Bey IV? Will authorities ever be able to charge anyone else in connection with Bailey’s death? How much confidence, if any, should Oakland residents have that public accountability will emerge from the state and local investigations of Longmire’s handling of the Bailey case and how his bosses, Lt. Ersie Joyner III and Deputy Chief Jeff Loman, supervised his work? What will the fallout be from The Chauncey Bailey Project’s revelations published Sunday that Oakland has the lowest homicide clearance rate in the state for a city of its size and that police leaders are unable to even agree on statistics? Were Longmire’s mistakes intentional to protect his friend Bey IV as Bey IV himself bragged on a secretly recorded police video? Or were they symptomatic of how badly broken the department is? Rains denies Longmire and Joyner did anything wrong. Former Capt. Frank Lowe, who Brown once tried to tap to replace Tucker, said he told then-Mayor Brown the department needed to move decisively and forcefully against violent crime. Instead, the department’s homicide clearance rate is the lowest among California’s large cities, according to Bailey Project analysis, while killings are continuing and thousands of violent crimes are going unpunished each year. The homicide unit is half the size it should be, Bailey Project research showed. Its 10 detectives each averaged 1,350 hours of overtime last year and often relied on interrogation instead of investigation to make their cases. The entire department is plagued by chronic understaffing. The division that deals with youth and family issues, for example, has 40 employees and a backlog of 3,000 cases of crimes such as child abuse, domestic violence and missing persons, Tucker said in a separate interview. Lowe said some veteran officers can’t wait to leave Oakland. Another former officer said another issue tearing at the department is that there is sometimes a “double standard” between the way officers and commanders are investigated, with sometimes higher standards of conduct applied to those of lower rank. Officers said that if the Bailey case questions are answered in 2009, it could help to right the Police Department. As the internal affairs and state investigations of how the case was handled go forward, the Alameda County district attorney’s office is investigating Bailey’s killing. Police Department e-mails obtained under a public records act request show communication at the highest levels between the department and the district attorney’s office about the Bailey case. E-mails show Deputy Police Chief Jeffrey Israel e-mailed District Attorney Tom Orloff what was described as “the Bey IV document” within days of the Bailey Project’s October reportage about undocumented evidence. Israel then reported to Jordan that he had sent the document, but details about the document where blacked out by the city attorney’s office before its release, and the attached document was not made public. A top Oakland official credited the Bailey Project with keeping alive the investigation. “The reporters are doing a better job than we are,” City Council President Ignacio De La Fuente said. Chauncey Bailey Project partner KTVU is scheduled to broadcast a version of this story on its 10 o’clock news program tonight. Roland De Wolk of KTVU and Bailey Project intern Andrew Palma contributed to this story. Thomas Peele is an investigative reporter for the Bay Area News Group; Bob Butler and Mary Fricker are independent journalists. Reach them at tpeele@bayareanewsgroup.com, bobbutler7@comcast.net and maryfricker@hughes.net.